This film totally took me by surprise as it seemed to be split into two seperate films. In the first 40 minutes, you think this film is going a certain way and then for the last hour it takes you on a totally different ride. Jude Law and Rooney Mara handed in amazing performances as a doctor and mental patient, respectively. Soderbergh is truly becoming one of my favorite directors as he tackles the issues in the world that others are afraid to even look at. 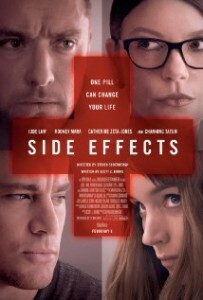 This film explores the very dangerous world of medical pills and how far down someone can fall by taking or prescribing them. The last half hour reminded me of something out of Wild Things or Striking Distance. It totally keeps you guessing and guides you down a path making things look different from what they seem. I recommend this movie to anyone who likes a real movie like Traffic or Contagion (Both Soderbergh) that takes a look at the real world and it’s flaws with the justice system.